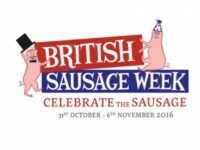 British Sausage Week 2016 (31 October – 6 November) is in its 19th year and is asking one-and-all to celebrate the sausage! And who better to sing the praises of the popular British banger than former X Factor contestant and chart-toping band member of JLS, Jonathan Benjamin ‘JB’ Gill. JB, who after selling millions of records and performing to countless number of fans across the globe, left the music industry to, with his wife Chloe and son, Ace, become a farmer who has since reared pigs and turkeys. A regular on BBC’s Countryfile and currently presenting CBeebies TV series, Down on the Farm, he has a passion for educating young and old about the countryside, which also includes plans to add author to his CV, with a range of books based around farming life planned for the future. JB will help British Sausage Week celebrate the sausage, by talking family-life, farming and foodie- favourites to the media. JB will award the best sausages in retailers, independent butchers/farm shops and catering establishments following a nationwide competition, which has drawn well over 700 entries. His son, Ace, has also got in on the action, and created one of the recipes for British Sausage Week, Ace’s Pork Sausage Fajita Wraps. JB Gill said: “It’s a huge pleasure to be involved in British Sausage Week 2016, celebrating the amazing range of sausages from around the country. In our house, sausages are always a go-to option for a quick, easy and tasty mid-week meal, which my family love tucking into. “I’m passionate about food and it’s one of the reasons why I went into farming. I know from my own experience the attention and care which goes into producing quality, fresh pork sausages, so when choosing your sausages look for the Red Tractor logo on the pack. This way you’re not only supporting British farmers, but ensuring the sausages you eat are from pigs produced to high welfare standards. And with more than 500 varieties to choose from, there’s a sausage to suit everyone’s tastes. If you’re looking for a sausage recipe with a twist, give my son’s sausage fajitas a go! “So please join me in celebrating the best bangers in the county during British Sausage Week which runs 31 October – 6 November. If you want to find some inspirational recipes or get more information on British Sausage Week 2016 go to www.lovepork.com”. Kirsty Walker, head of marketing at AHDB Pork, said: “Pork sausages offer busy families a quick and tasty meal solution, at any time of day. Sausages are incredibly versatile as they can be eaten during any meal occasion. I think part of their appeal is that sausages can be eaten in more traditional dishes, like with mash or in casseroles, but they also lend themselves to being transformed into dishes from other cuisines.